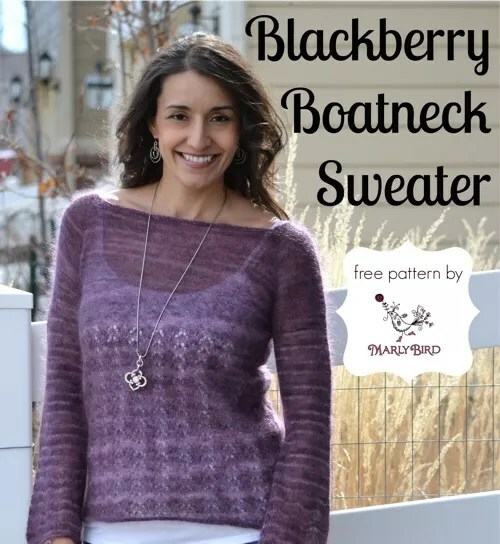 A perfect sweater to wear anytime of year, the Blackberry Boatneck Sweater is a beautiful sheer piece that looks great over a simple camisole paired with jeans or a nice skirt. Knit top-down in stockinette for the upper body and a simple lace for the body and sleeve cuffs; this piece is a rather relaxing project. Subtle a-line shaping around the body and the natural stretch of the lace makes this sweater fit nicely around the body. You can adjust where you begin the lace portion if you are more ample and want a bit more room between your bust and the start of the lace but at the same time I think the lace portion as written looks nice where it lands on the bust. Honestly, I think this sweater would be beautiful on any body type. Let’s talk about the yarn I used because that is what really makes this piece PERFECT! As a designer, I try really hard to pick the perfect yarn for each of my projects. I must be honest though, for this one I wasn’t the one to choose this amazing yarn, it was the editor of the magazine it was originally published in so I can’t take credit. Jen Burt really did make the perfect pairing. This awesome top down knit sweater is made all the more beautiful because of the yarn. SweetGeorgia Yarns Silk Mist is a perfect combination of mohair and silk. This coupling creates a perfectly fuzzy, hazy fabric with a little shimmer and strength. It is incredibly soft and wonderful against the skin. Knowing that the yarn had a little haze to it I kept the lace portion of the bodice simple as the eyelets are obscured by the yarn. But I think the eyelets created with the yarn overs are perfect peek-a-boo’s for the cami you wear underneath. Now that I’ve told you the history behind the sweater I want to offer you the Blackberry Boatneck Sweater pattern for FREE! 114.5, 122, 129.5, 137, 145) cm] bust circumference. Sample knit in size 39″ [99 cm] shown on a 37” bust. cultivated silk; 325 yds [297 m], .88 oz [25 g];): Blackberry, 4 (4, 4, 5, 5, 5, 6, 6, 6) skeins. Needles:Size US 5 (3.75 mm); 16″ and32″ circular needles and double pointed (dpns), or size to obtain correct gauge. 24 sts and 32 rows = 4″ [10 cm] in St st.
22 sts and 32 rows = 4″ [10 cm] in Lace pat. from the front to the back, knit through the back loop (1 st increased). from the back to the front, knit through the front loop (1 st increased). Stockinette Stitch (St st) Knit all sts, every rnd. for desired number of sts. Rnds 2, 4, 5 and 6: Knit. Rep rnds 1–6 for Lace pat. rnd, being careful not to twists sts. rep from * for second sleeve and back. Inc Rnd (body and sleeves): *K1, M1L, knit to 1 st before m, M1R, k1, sl m; rep from * 3 more times—8 sts inc’d. Rep the last rnd 2 (3, 6, 8, 11, 15, 16, 18, 23) more times—134 (146, 176, 192, 222, 258, 268, 288, 334) sts total; 18 (19, 25, 28, 34, 41, 41, 44, 54) sts each sleeve, 49 (54, 63, 68, 77, 88, 93, 100, 113) sts each front and back. Inc Rnd (sleeves only): *K1, M1L, knit to 1 st before m, M1R, k1, sl m, knit to next m; rep from * once more—4 sts inc’d. Rep the last 2 rnds 4 (4, 3, 2, 0, 0, 0, 0, -) more times—182 (194, 212, 216, 234, 270, 280, 300, -) sts total; 34 (35, 37, 36, 38, 45, 45, 48, -) sts each sleeve, 57 (62, 69, 72, 79, 90, 95, 102, -) sts each front and back. to 1 st before m, M1R, k1, sl m; rep from * 3 more times—8 sts inc’d. Rep the last 2 rnds 18 (20, 21, 23, 24, 23, 24, 25, 24) more times—334 (362, 388, 408, 434, 462, 480, 508, 534) sts total; 72 (77, 81, 84, 88, 93, 95, 100, 104) sts each sleeve, 95 (104, 113, 120, 129, 138, 145, 154, 163) sts each front and back. 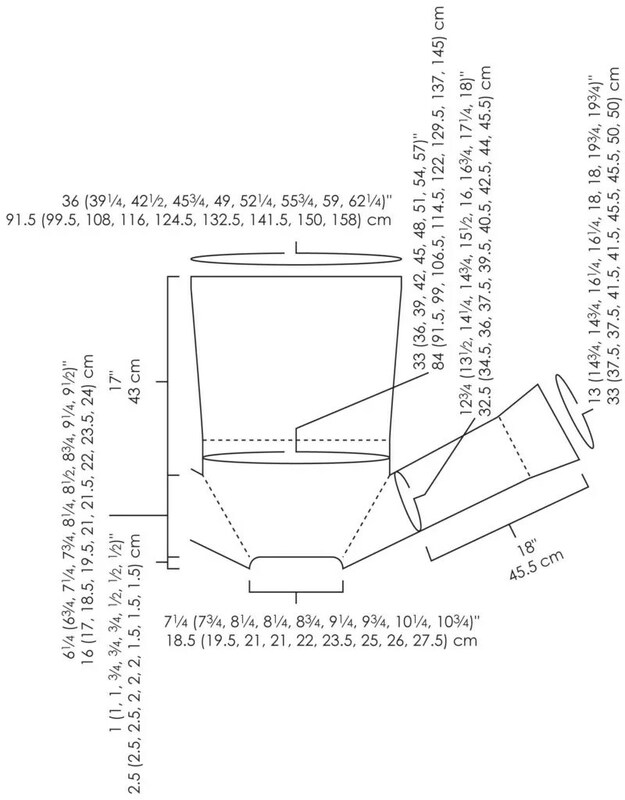 *Place 72 (77, 81, 84, 88, 93, 95, 100, 104) sleeve sts onto st holder or waste yarn, use the backwards loop method to CO 2 (2, 2, 3, 3, 3, 4, 4, 4) sts, pm for new beg of rnd, then CO 2 (2, 2, 3, 3, 3, 4, 4, 4) more sts, remove m between sleeve and body, then knit across back sts to next m, remove m; rep from * once more placing side marker and working across the front, then knit to new beg of rnd m—198 (216, 234, 252, 270, 288, 306, 324, 342) sts. the sewn bind off (see pattern stitches). Return 72 (77, 81, 84, 88, 93, 95, 100, 104) held sleeve sts to dpns. Beg at center of underarm CO sts, pick up and knit 2 (2, 2, 3, 3, 3, 4, 4, 4) sts, knit across held sts, then pick up and knit 2 (2, 2, 3, 3, 3, 4, 4, 4) more sts along rem CO sts—76 (81, 85, 90, 94, 99, 103, 108, 112) sts. Pm for beg of rnd. Work even in St st until piece meas 2” from underarm. Dec Rnd: K1, k2tog, knit to last 3 sts, ssk, k1—2 sts dec’d. Work 23 rnds even, then work dec rnd again—72 (-, 81, 0, 90, -, 99, -, 108) sts rem. Cont working even in St st until piece meas 12″ from underarm. Work in Lace Pat for 5″, then work in St st for 1″. BO all sts using the sewn bind off (see pattern stitches)..
Work second sleeve in the same manner. Block piece to measurements. Weave in ends. Beautiful beautiful sweater and pattern! !